Ingredients: 2827 Humango £7.50 Sodium Bicarbonate, Citric Acid, *Citral, Cocoa Butter (Theobroma cacao), Lemongrass Oil (Cymbopogon schoenanthus), Laureth 4, Lemon Oil (Citrus limonum), Lime Oil (Citrus aurantifolia), Avocado Butter (Persea gratissima), Mango Butter (Mangifera indica), Almond Oil (Prunus dulcis), *Geraniol, *Citronellol, *Limonene, *Linalool, Perfume, Paprika Extract (Capsicum frutescens). Here’s a demo video I did of Humango. 4 out of 5 rating. See my demo and review video of this soap below. This smells just like the Avobath bath bomb or even the you’ve been managed bath oil. Here’s a video demo/review i made of these Limelight toothy tabs. All the worlds a stage. Get ready for your big moment with super citrusy lime oil. This has lime, lemon and almond oil. The shimmery green color is pretty. While these were pleasant, they’re not my favorite of the 5 new Lush toothy tabs debuting first at Lush Oxford Street store. As i said in my video it’s not bad, it’s not fabulous, but somewhere in the middle. I didn’t taste as much lime as i thought i would considering the tastiness of the other toothy tabs i’ve tried. Still it made my mouth feel squeaky clean. Here’s a video demo i made of Limelight toothy tabs. See my other toothy tab demos: Bling, Oral Pleasure, Tooth Fairy, Miles of Smiles. Ingredients: £2.15 100g Sodium Bicarbonate, Perfume, Pink Rosebud, Lemon Oil, Orange Oil, Rose Absolute. Review: The blend of rose and an orangey citrus is wonderful. Not a strong scent, more sublime. I wish they’d make a perfume out of this one. The heart shaped Amandopondo soap on the left came in the giant 1000g Lush gift “Pink Caroline” ballistic. (see under gifts). Lush Times 2006 Description: The Amandopondo bar has a little history. 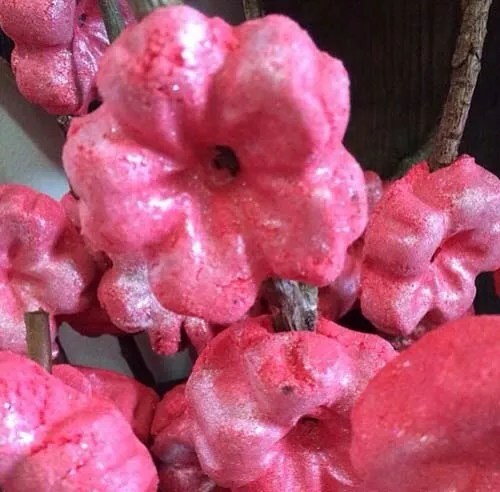 Its name means (we think) ‘I am defeated’ and it was made to commemorate the time when someone copied Lush products then tried to sue us for using his ideas – the cheek of it – on Christmas Eve!! Now didn’t that just spoil Lush’s Christmas Day? When he lost the case there was a little clause in the settlement that made him send six roses to say ‘sorry’. Hence, the Amandopondo is made with rose absolute perfume and topped with a real rosebud and it is our best little gift for saying ‘sorry’ to someone. It also smells of refreshing lemons, used to produce clarity of thought, and revitalising oranges to revive and calm the mind. An Amandopondo bath is an excellent way to forgive and forget whatever went wrong and start afresh. Lush 1999 description: A fresh, tangy but mellow bomb full of ferns and pieces of lemon grass, reminscent of a walk through a forest. As the water runs away you can read the pattern which the fern leaves make on the bath, like reading your fortune in tea leaves in the bottom of a cup. This is Lush’s homage to daft fads. It is scented with delightful lemon grass oil, which we shall continue to use long after the current trend for sticking it in every dish in astonishingly expensive London restaurants has long since been forgotten. I was surprised at how much plant material thereis in this bath bomb. It definitely lives up to it’s name. Tons of plant stuff. Alsosurprising to me is the smell. I love the smell. It’s not like anything i’ve smelled before bath bomb wise. It’s fresh, lemongrass and the pleasant smell of greenery. The first time i used this bath bomb i didn’t use anything to contain the pieces of ferns. The second time i used this is got a small kitchen strainer and put the bomb in there so i got just the water, not the plants.